Suzette Beresford walks into her new Habitat for Humanity home in Silt while volunteers make last minute adjustments on Thursday afternoon. As a single mother living in the Roaring Fork Valley, Suzette Beresford would ask herself how she was going to make it on her own. But with help from Habitat for Humanity and the community she will soon call home, Beresford now knows she’s not alone. By the end of the month, Beresford and her three children will be moved into their newly built Habitat for Humanity home on the east side of Silt. The Beresfords are one of several families who will have received a new home in Silt in recent years through Habitat for Humanity Roaring Fork. Before she was officially approved by Habitat for Humanity, Beresford took her children to the ground that would become their future home. “I snuck in and told my daughter this would be where our home would be built,” she explained. She said her daughter didn’t want to jinx it. The Beresford family was approved for their home in mid-October. This week, Suzette was out cleaning and making finishing touches on her house, as her move in date was pushed to May 19. She, along with dozens of women volunteers, were out at Habitat for Humanity’s duplexes in Silt as the local organization celebrated National Women Build Week from May 5 to May 13, with thousands of women volunteers nationwide helping to build homes for their neighbors. “I feel like I get to know the entire valley as our nurses live throughout and it’s really fun to connect with all of our areas,” said Valley View nurse Dawn Sculco, who helps coordinate nurses to volunteer for Women Build Week each year. Last year, she said around 50 nurses came out to volunteer. 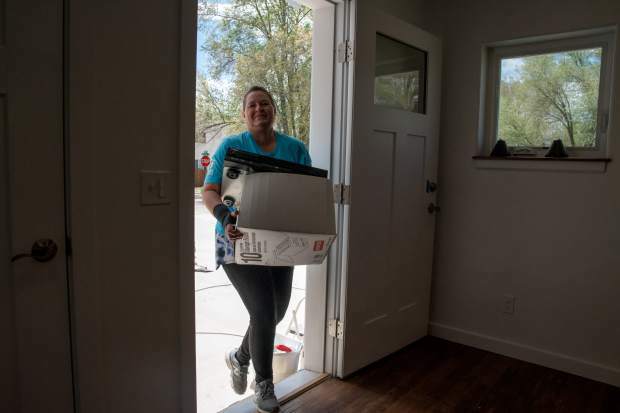 Amy French, Habitat for Humanity of the Roaring Fork Valley volunteer coordinator, told the Post Independent that approximately 53 percent of the homes are built by paid staff and contractors, with volunteers supporting more than 40 percent and homeowners coming in for the final 5 percent. Adult homeowners must contribute 250 hours to building themselves, known as “sweat equity hours,” according to French.